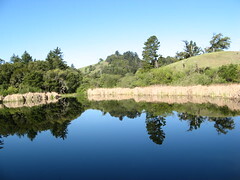 Skyline Ridge Open Space Preserve has good trails and gorgeous vistas, but I go for the ponds. Driving directions: Take I-280 to Page Mill Road exit. Go west on Page Mill for 8.6 miles to Skyline Boulevard (Highway 35). Go south one mile; park entrance is on the west side of Skyline. The preserve offers two: One’s a short stroll from the parking lot, the other about a mile and a half up the Ridge Trail. Either one will clue you in on Henry David Thoreau’s fondness for ponds: the waterfowl splashing about, the breeze rippling across the water’s surface. You may have to kick yourself to get back on the trail. Skyline Ridge is one of a string of preserves managed by the Midpeninsula Regional Open Space District along Skyline Boulevard in the Santa Cruz Mountains crest west of the Santa Clara Valley. The main attractions are Alpine Pond and its nature center, staffed by volunteers on weekends. A wooden walkway allows close inspection of life at the pond’s edge, and there’s a drinking fountain nearby to refresh your water supply. Trails are easy to moderate with a nice mix of sun and shade. The wildflower show was fair to middling when I last visited on the second weekend in April. Standard precautions: Springtime is rattlesnake season – watch for them in sunny, rocky areas. Bring sunscreen and layers; it can be warm and breezy. Make sure you’ve got plenty of water if you decide to hike to any of the preserves nearby. Easy: A stroll around Horseshoe Lake (trust me, it’s actually a pond), next to the main parking lot, requires hardly any effort; wander south to the old Christmas tree farm if you’re feeling more energetic, for just under two miles of hiking. There’s always something magical about walking amid Christmas trees. Moderate: An out-and-back on the Ridge Trail to Alpine Pond is three miles, but you can add more distance by walking around it, or venturing north to Russian Ridge Open Space Preserve to check out the rich array of wildflowers blooming there.